This article is about the four cultivated plants in the family Erythroxylaceae. For the drug, see Cocaine. For other uses, see Coca (disambiguation). The plant is grown as a cash crop in Argentine Northwest, Bolivia, Colombia, Ecuador, and Peru, even in areas where its cultivation is unlawful. There are some reports that the plant is being cultivated in the south of Mexico as a cash crop and an alternative to smuggling its recreational product cocaine. It also plays a role in many traditional Andean cultures as well as the Sierra Nevada de Santa Marta (see Traditional uses). Coca is known throughout the world for its psychoactive alkaloid, cocaine. The alkaloid content of coca leaves is relatively low, between 0.25% and 0.77%. The native people use it for a stimulant, like coffee, or an energy source or both. Coca-Cola used coca leaf extract in its products from 1885 and until about 1903. Extraction of cocaine from coca requires several solvents and a chemical process known as an acid-base extraction, which can fairly easily extract the alkaloids from the plant. Erythroxylum coca var. coca (Bolivian or Huánuco Coca) – well adapted to the eastern Andes of Peru and Bolivia, an area of humid, tropical, montane forest. Erythroxylum coca var. ipadu (Amazonian Coca) – cultivated in the lowland Amazon Basin in Peru and Colombia. There are two main theories relating to the evolution of the cultivated cocas. The first (put forth by Plowman and Bohm) suggests that Erythroxylum coca var. 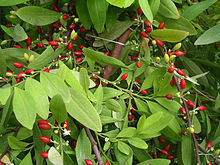 coca is ancestral, while Erythroxylum novogranatense var. truxillense is derived from it to be drought tolerant, and Erythroxylum novogranatense var. novogranatense derived from Erythroxylum novogranatense var. truxillense. Recent research based on genetic evidence (Johnson et al. in 2005, Emche et al. in 2011, and Islam 2011) does not support this linear evolution and instead suggests a second domestication event as the origin of the Erythroxylum novogranatense varieties. There may be a common, but undiscovered ancestor. 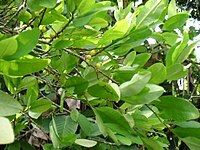 The two subspecies of Erythroxylum coca are almost indistinguishable phenotypically. Erythroxylum novogranatense var. 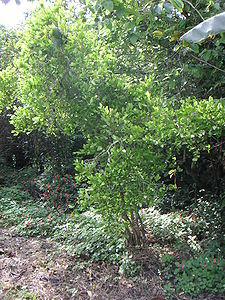 novogranatense and Erythroxylum novogranatense var. truxillense are phenotypically similar, but morphologically distinguishable. Under the older Cronquist system of classifying flowering plants, this was placed in an order Linales; more modern systems place it in the order Malpighiales. Also known as supercoca or la millionaria, Boliviana negra is a relatively new form of coca that is resistant to a herbicide called glyphosate. Glyphosate is a key ingredient in the multibillion-dollar aerial coca eradication campaign undertaken by the government of Colombia with U.S. financial and military backing known as Plan Colombia. The herbicide resistance of this strain has at least two possible explanations: that a “peer-to-peer” network of coca farmers used selective breeding to enhance this trait through tireless effort, or the plant was genetically modified in a laboratory. In 1996, a patented glyphosate-resistant soybean was marketed by Monsanto Company, suggesting that it would be possible to genetically modify coca in an analogous manner. Spraying Boliviana negra with glyphosate would serve to strengthen its growth by eliminating the non-resistant weeds surrounding it. Joshua Davis, in the Wired article cited below, found no evidence of CP4 EPSPS, a protein produced by the glyphosate-resistant soybean, suggesting Bolivana negra was either created in a lab by a different technique or bred in the field. 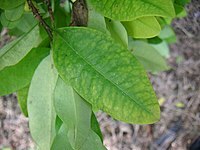 The pharmacologically active ingredient of coca is the cocaine alkaloid, which is found in the amount of about 0.3 to 1.5%, averaging 0.8%, in fresh leaves. Besides cocaine, the coca leaf contains a number of other alkaloids, including methylecgonine cinnamate, benzoylecgonine, truxilline, hydroxytropacocaine, tropacocaine, ecgonine, cuscohygrine, dihydrocuscohygrine, nicotine, and hygrine. When chewed, coca acts as a mild stimulant and suppresses hunger, thirst, pain, and fatigue. Absorption of coca from the leaf is less rapid than nasal application of purified forms of the alkaloid (almost all of the coca alkaloid is absorbed within 20 minutes of nasal application, while it takes 2–12 hours after ingestion of the raw leaf for alkaline concentrations to peak.). When the raw leaf is consumed in tea, between 59 and 90% of the coca alkaloid is absorbed. Traces of coca leaves found in northern Peru dates the communal chewing of coca with lime 8000 years back. Other evidence of coca traces have been found in mummies dating 3000 years back in northern Chile. Beginning with the Valdivian culture, circa 3000 BC, there is an unbroken record of coca leaf consumption by succeeding cultural groups on the coast of Ecuador until European arrival as shown in their ceramic sculpture and abundant caleros or lime pots. Lime containers found in the north coast of Peru date around 2000 BC as evidenced by the findings at Huaca Prieta and the Jetetepeque river valley. Extensive archaeological evidence for the chewing of coca leaves dates back at least to the 6th century AD Moche period, and the subsequent Inca period, based on mummies found with a supply of coca leaves, pottery depicting the characteristic cheek bulge of a coca chewer, spatulas for extracting alkali and figured bags for coca leaves and lime made from precious metals, and gold representations of coca in special gardens of the Inca in Cuzco. Coca chewing may originally have been limited to the eastern Andes before its introduction to the Inca. As the plant was viewed as having a divine origin, its cultivation became subject to a state monopoly and its use restricted to nobles and a few favored classes (court orators, couriers, favored public workers, and the army) by the rule of the Topa Inca (1471–1493). As the Incan empire declined, the leaf became more widely available. After some deliberation, Philip II of Spain issued a decree recognizing the drug as essential to the well-being of the Andean Indians but urging missionaries to end its religious use. The Spanish are believed to have effectively encouraged use of coca by an increasing majority of the population to increase their labor output and tolerance for starvation, but it is not clear that this was planned deliberately. Coca was first introduced to Europe in the 16th century, but did not become popular until the mid-19th century, with the publication of an influential paper by Dr. Paolo Mantegazza praising its stimulating effects on cognition. This led to invention of coca wine and the first production of pure cocaine. Coca wine (of which Vin Mariani was the best-known brand) and other coca-containing preparations were widely sold as patent medicines and tonics, with claims of a wide variety of health benefits. The original version of Coca-Cola was among these. These products became illegal in most countries outside of South America in the early 20th century, after the addictive nature of cocaine was widely recognized. In 1859, Albert Niemann of the University of Göttingen became the first person to isolate the chief alkaloid of coca, which he named “cocaine”. In the early 20th century, the Dutch colony of Java became a leading exporter of coca leaf. By 1912 shipments to Amsterdam, where the leaves were processed into cocaine, reached 1000 tons, overtaking the Peruvian export market. Apart from the years of the First World War, Java remained a greater exporter of coca than Peru until the end of the 1920s. Other colonial powers also tried to grow coca (including the British in India), but with the exception of the Japanese in Formosa, these were relatively unsuccessful. In recent times (2006), the governments of several South American countries, such as Peru, Bolivia and Venezuela, have defended and championed the traditional use of coca, as well as the modern uses of the leaf and its extracts in household products such as teas and toothpaste. The coca plant was also the inspiration for Bolivia’s Coca Museum. Traditional medical uses of coca are foremost as a stimulant to overcome fatigue, hunger, and thirst. It is considered particularly effective against altitude sickness. It also is used as an anesthetic and analgesic to alleviate the pain of headache, rheumatism, wounds and sores, etc. Before stronger anaesthetics were available, it also was used for broken bones, childbirth, and during trepanning operations on the skull. The high calcium content in coca explains why people used it for bone fractures. Because coca constricts blood vessels, it also serves to oppose bleeding, and coca seeds were used for nosebleeds. Indigenous use of coca has also been reported as a treatment for malaria, ulcers, asthma, to improve digestion, to guard against bowel laxity, as an aphrodisiac, and credited with improving longevity. Modern studies have supported a number of these medical applications. Coca has also been a vital part of the religious cosmology of the Andean peoples of Peru, Bolivia, Ecuador, Colombia, northern Argentina, and Chile from the pre-Inca period through to the present. Coca leaves play a crucial part in offerings to the apus (mountains), Inti (the sun), or Pachamama (the earth). Coca leaves are also often read in a form of divination analogous to reading tea leaves in other cultures. As one example of the many traditional beliefs about coca, it is believed by the miners of Cerro de Pasco to soften the veins of ore, if masticated (chewed) and thrown upon them (see Cocomama in Inca mythology). In addition, coca use in shamanic rituals is well documented wherever local native populations have cultivated the plant. For example, the Tayronas of Colombia’s Sierra Nevada de Santa Marta would chew the plant before engaging in extended meditation and prayer. Traditionally, coca leaves are prepared either to chew or as a tea (mate de coca). Chewing coca leaves is most common in indigenous communities across the central Andean region, particularly in places like the highlands of Argentina, Colombia, Bolivia, and Peru, where the cultivation and consumption of coca is a part of the national culture, similar to chicha. It also serves as a powerful symbol of indigenous cultural and religious identity, amongst a diversity of indigenous nations throughout South America. Tobacco leaves were also traditionally chewed in the same way in North America, though modern chewing tobacco is typically heavily processed. One option for chewing coca is with a tiny quantity of ilucta (a preparation of the ashes of the quinoa plant) added to the coca leaves; it softens their astringent flavor and activates the alkaloids. Other names for this basifying substance are llipta in Peru and the Spanish word lejía, bleach in English. The consumer carefully uses a wooden stick (formerly often a spatula of precious metal) to transfer an alkaline component into the quid without touching his flesh with the corrosive substance. The alkali component, usually kept in a gourd (ishcupuro or poporo), can be made by burning limestone to form unslaked quicklime, burning quinoa stalks, or the bark from certain trees, and may be called ilipta, tocra or mambe depending on its composition. Many of these materials are salty in flavor, but there are variations. The most common base in the La Paz area of Bolivia is a product known as lejía dulce (sweet lye), which is made from quinoa ashes mixed with aniseed and cane sugar, forming a soft black putty with a sweet and pleasing flavor. In some places, baking soda is used under the name bico. In the Sierra Nevada de Santa Marta, on the Caribbean Coast of Colombia, coca is consumed by the Kogi, Arhuaco, and Wiwa by using a special device called poporo. It represents the womb and the stick is a phallic symbol. The movements of the stick in the poporo symbolize the sexual act. For a man the poporo is a good companion that means “food”, “woman”, “memory”, and “meditation”. The poporo is the mark of manhood. When a boy is ready to be married, his mother initiates him in the use of the coca. This act of initiation is carefully supervised by the Mamo, a traditional priest-teacher-leader. Fresh samples of the dried leaves, uncurled, are a deep green colour on the upper surface, and a grey-green on the lower surface, and have a strong tea-like aroma. When chewed, they produce a pleasurable numbness in the mouth, and have a pleasant, pungent taste. They are traditionally chewed with lime or some other reagent such as bicarbonate of soda to increase the release of the active ingredients from the leaf. Older species have a camphoraceous smell and a brownish color, and lack the pungent taste. A cup of mate de coca served in a coffee shop in Cuzco, Peru. Although coca leaf chewing is common only among the indigenous populations, the consumption of coca tea (Mate de coca) is common among all sectors of society in the Andean countries, especially due to their high elevations from sea level, and is widely held to be beneficial to health, mood, and energy. Coca leaf is sold packaged into teabags in most grocery stores in the region, and establishments that cater to tourists generally feature coca tea. Coca is used industrially in the cosmetics and food industries. A decocainized extract of coca leaf is one of the flavoring ingredients in Coca-Cola. Before the criminalization of cocaine, however, the extract was not decocainized. Therefore, Coca-Cola’s original formula did include cocaine. Coca tea is produced industrially from coca leaves in South America by a number of companies, including Enaco S.A. (National Company of the Coca) a government enterprise in Peru. Coca leaves are also found in a brand of herbal liqueur called “Agwa de Bolivia” (grown in Bolivia and de-cocainized in Amsterdam), and a natural flavouring ingredient in Red Bull Cola, that was launched in March 2008. Beginning in the early 21st century, there has been a movement in Bolivia, Peru, and Venezuela to promote and expand legal markets for the crop. The presidents of these three countries have personally identified with this movement. In particular, Evo Morales of Bolivia (elected in December 2005) was a coca grower’s union leader. Morales asserts that “la coca no es cocaína“—the coca leaf is not cocaine. During his speech to the General Assembly of the United Nations on September 19, 2006, he held a coca leaf in his hand to demonstrate its innocuity. Alan García, president of Peru, has recommended its use in salads and other edible preparations. A Peruvian-based company has announced plans to market a modern version of Vin Mariani, which will be available in both natural and de-cocainized varieties. In Venezuela, former president Hugo Chávez said in a speech on January 2008 that he chews coca every day, and that his “hook up” is Bolivian president Evo Morales. Chávez reportedly said “I chew coca every day in the morning… and look how I am” before showing his biceps to his audience, the Venezuelan National Assembly. On the other hand, the Colombian government has recently moved in the opposite direction. For years, Bogotá has allowed indigenous coca farmers to sell coca products, promoting the enterprise as one of the few successful commercial opportunities available to recognized tribes like the Nasa, who have grown it for years and regard it as sacred. In December 2005, the Paeces – a Tierradentro (Cauca) indigenous community – started to produce a carbonated soft drink called “Coca Sek“. The production method belongs to the resguardos of Calderas (Inzá) and takes about 150 kg (331 lb) of coca per 3,000 produced bottles. The drink was never sold widely in Colombia and efforts to do so ended in May 2007 when it was abruptly banned by the Colombian government. Coca Colla is an energy drink which is produced in Bolivia with the use of coca extract as its base. It was launched on the Bolivian markets in La Paz, Santa Cruz, and Cochabamba in mid-April 2010. Probably the earliest reference to coca in English literature is Abraham Cowley‘s poem “A Legend of Coca” in his 1662 collection of poems “Six Books of Plants”. In the series of Aubrey-Maturin novels by Patrick O’Brien, set during the Napoleonic wars, Dr. Stephen Maturin, a naval physician, naturalist, and British intelligence agent discovers the use of coca leaves on a mission to Peru, and makes regular use of them in several of the later novels in the series. Coca leaf is the raw material for the manufacture of the drug cocaine, a powerful stimulant and anaesthetic extracted chemically from large quantities of coca leaves. Today, since it has mostly been replaced as a medical anaesthetic by synthetic analogues such as procaine, cocaine is best known as an illegal recreational drug. The cultivation, sale, and possession of unprocessed coca leaf (but not of any processed form of cocaine) is generally legal in the countries – such as Bolivia, Peru, Chile, and Argentine Northwest – where traditional use is established, although cultivation is often restricted in an attempt to control the production of cocaine. In the case of Argentina, it is legal only in some northwest provinces where the practice is so common that the state has accepted it. The prohibition of the use of the coca leaf except for medical or scientific purposes was established by the United Nations in the 1961 Single Convention on Narcotic Drugs. The coca leaf is listed on Schedule I of the 1961 Single Convention together with cocaine and heroin. The Convention determined that “The Parties shall so far as possible enforce the uprooting of all coca bushes which grow wild. They shall destroy the coca bushes if illegally cultivated” (Article 26), and that, “Coca leaf chewing must be abolished within twenty-five years from the coming into force of this Convention” (Article 49, 2.e). The historic rationale for international prohibition of coca leaf in the 1961 Single Convention comes from “The Commission of Enquiry on the Coca Leaf study” published in 1950. It was requested of the United Nations by the permanent representative of Peru, and was prepared by a commission that visited Bolivia and Peru briefly in 1949 to “investigate the effects of chewing the coca leaf and the possibilities of limiting its production and controlling its distribution.” It concluded that the effects of chewing coca leaves were negative, even though chewing coca was defined as a habit, not an addiction. The report was sharply criticised for its arbitrariness, lack of precision, and racist connotations. The team members’ professional qualifications and parallel interests were also criticised, as were the methodology used and the incomplete selection and use of existing scientific literature on the coca leaf. Questions have been raised as to whether a similar study today would pass the scrutiny and critical review to which scientific studies are routinely subjected. Despite the legal restriction among countries party to the international treaty, coca chewing and drinking of coca tea is carried out daily by millions of people in the Andes as well as considered sacred within indigenous cultures. Coca consumers claim that most of the information provided about the traditional use of the coca leaf and its modern adaptations are erroneous. This has made it impossible to shed light on the plant’s positive aspects and its potential benefits for the physical, mental, and social health of the people who consume and cultivate it. Article 26 of the Single Convention on Narcotic Drugs requires nations that allow the cultivation of coca to designate an agency to regulate said cultivation and take physical possession of the crops as soon as possible after harvest, and to destroy all coca which grows wild or is illegally cultivated. The effort to enforce these provisions, referred to as coca eradication, has involved many strategies, ranging from aerial spraying of herbicides on coca crops to assistance and incentives to encourage farmers to grow alternative crops. This effort has been politically controversial, with proponents claiming that the production of cocaine is several times the amount needed to satisfy legal demand and inferring that the vast majority of the coca crop is destined for the illegal market. As per the proclaimed view, this not only contributes to the major social problem of drug abuse but also financially supports insurgent groups that collaborate with drug traffickers in some cocaine-producing territories. Critics of the effort claim that it creates hardship primarily for the coca growers, many of whom are poor and have no viable alternative way to make a living, causes environmental problems, that it is not effective in reducing the supply of cocaine, in part because cultivation can move to other areas, and that any social harm created by drug abuse is only made worse by the War on Drugs. The environmental problems include “ecocide”, where vast tracts of land and forest are sprayed with glyphosate or Roundup, with the intention of eradicating the coca plant. However, the incidental environmental damage is severe, because many plant species are wiped out in the process. Coca has been reintroduced to the United States as a flavoring agent in the herbal liqueur Agwa de Bolivia. The primary organization authorized to purchase coca leaves is ENACO S.A., headquartered in Peru. Outside of South America, most countries’ laws make no distinction between the coca leaf and any other substance containing cocaine, so the possession of coca leaf is prohibited. In South America coca leaf is illegal in both Paraguay and Brazil. In the Netherlands, coca leaf is legally in the same category as cocaine, both are List I drugs of the Opium Law. The Opium Law specifically mentions the leaves of the plants of the genus Erythroxylon. However, the possession of living plants of the genus Erythroxylon is not actively prosecuted, even though they are legally forbidden. In the United States, a Stepan Company plant in Maywood, New Jersey is a registered importer of coca leaf. The company manufactures pure cocaine for medical use and also produces a cocaine-free extract of the coca leaf, which is used as a flavoring ingredient in Coca-Cola. Other companies have registrations with the DEA to import coca leaf according to 2011 Federal Register Notices for Importers, including Johnson Matthey, Inc, Pharmaceutical Materials; Mallinckrodt Inc; Penick Corporation; and the Research Triangle Institute. Analysts have noted the substantial importation of coca leaf into the USA. but the actual quantity is unknown. Coca leaf is considered a Schedule 9 prohibited substance in Australia under the Poisons Standard (October 2015). A Schedule 9 substance is a substance which may be abused or misused, the manufacture, possession, sale or use of which should be prohibited by law except when required for medical or scientific research, or for analytical, teaching or training purposes with approval of Commonwealth and/or State or Territory Health Authorities. ^ Drug Enforcement Administration (April 23, 2013). “Coca: History”. archive.org/. Internet Archive. Archived from the original on October 25, 2014. Retrieved February 16, 2015. ^ a b Plowman, T (1979). “Botanical Perspectives on Coca”. Journal of Psychedelic Drugs. 11 (1–2): 103–117. ^ De la Cruz, Manuel. “Policía mexicana realiza el primer hallazgo de cultivos de coca en el sur del país”. La Republica. Retrieved 27 March 2016. ^ Plowman, T; Rivier L (1983). “Cocaine and Cinnamoylcocaine content of thirty-one species of Erythroxylum (Erythroxylaceae)”. Annals of Botany. London. 51: 641–659. ^ a b May, Clifford D (1988-07-01). “How Coca-Cola Obtains Its Coca”. The New York Times. A Stepan laboratory in Maywood, N.J., is the nation’s only legal commercial importer of coca leaves, which it obtains mainly from Peru and, to a lesser extent, Bolivia. Besides producing the coca flavoring agent for Coca-Cola, Stepan extracts cocaine from the coca leaves, which it sells to Mallinckrodt Inc., a St. Louis pharmaceutical manufacturer that is the only company in the United States licensed to purify the product for medicinal use. ^ “Coca Leaf”. tni.org. 1 January 2015. ^ Plowman T. “The Origin, Evolution, and Diffusion of Coca, Erythroxylum spp., in South and Central America.” In: Stone D, ed. Pre-Columbian Plant Migration. Papers of the Peabody Museum of Archaeology and Ethnology. Harvard University. Vol 76. Cambridge MA: Harvard University Press; 1984. p. 125-163. ^ Bohm, B; Ganders F; Plowman T (1982). “Biosystematics and Evolution of Cultivated Coca (Erythroxylaceae)”. Systematic Botany. 7 (2): 121–133. doi:10.2307/2418321. ^ Johnson, E; Zhang D; Emche S (2005). “Inter- and Intra-specific Variation among Five Erythroxylum Taxa Assessed by AFLP”. Annals of Botany. 95: 601–608. doi:10.1093/aob/mci062. PMC 4246853. PMID 15650009. ^ a b Emche, S; Zhang D; Islam M; Bailey B; Meinhardt L (2011). “AFLP Phylogeny of 36 Erythroxylum Species Genetic Relationships Among Erythroxylum Species Inferred by AFLP Analysis”. Tropical Plant Biology. 4: 126–133. doi:10.1007/s12042-011-9070-9. ^ Evolutionary History: Uniting History and Biology to Understand Life on Earth, Edmund Russell. Cambridge University Press. 2011. ISBN 978-0-521-74509-3. Retrieved 2011-03-12. ^ Dion, Michelle L; Russler, Catherine (2008). “Eradication Efforts, The State, Displacement And Poverty: Explaining Coca Cultivation In Colombia During Plan Colombia”. Journal of Latin American Studies. 40.3: 399–421. doi:10.1017/s0022216x08004380. ^ “Illicit Production of Cocaine – [www.rhodium.ws]”. Erowid.org. Retrieved 2013-03-26. ^ Jenkins, Amanda; Llosa, Teobaldo; Montoya, Ivan; Cone, Edward (February 9, 1996). “Identification and quantitation of alkaloids in coca tea”. Forensic Sci Int. 77 (3): 179–189. doi:10.1016/0379-0738(95)01860-3. PMC 2705900. PMID 8819993. ^ a b Weil, AT (Mar–May 1981). “The therapeutic value of coca in contemporary medicine”. Journal of Ethnopharmacology. 3 (2–3): 367–76. doi:10.1016/0378-8741(81)90064-7. PMID 6113306. ^ National Institute on Drug Abuse. “Letter from the Director – National Institute on Drug Abuse (NIDA)”. nih.gov. ^ BS, Liao; RL, Hilsinger; BM, Rasgon; K, Matsuoka; KK, Adour (Jan 1999). “A preliminary study of cocaine absorption from the nasal mucosa”. Laryngoscope. 109 (1): 98–102. doi:10.1097/00005537-199901000-00019. PMID 9917048. ^ Mazor, Susan; Mycyk, Mark; Wills, Brandon; Brace, Larry; Gussow, Leon; Erickson, Timothy (Dec 2006). “Coca tea consumption causes positive urine cocaine assay” (PDF). Eur J Emerg Med. 13 (6): 341. Retrieved August 4, 2014. ^ Jackson, GF; Saady, JJ; Poklis, A (Jan–Feb 1991). “Urinary excretion of benzoylecgonine following ingestion of Health Inca Tea”. Forensic Sci Int. 49 (1): 57–64. doi:10.1016/0379-0738(91)90171-e. PMID 2032667. ^ Hanna JM, Hornick CA., “Use of coca leaf in southern Peru: adaptation or addiction,” Bull Narc. 1977 Jan–Mar;29(1):63–74. ^ “Report of the Commission of Enquiry on the Coca Leaf” (PDF). United Nations Economic and Social Council: 31. May 1950. Retrieved August 4, 2014. ^ Hurtado-Gumucio, J (October 2000). “Coca leaf chewing as therapy for cocaine maintenance”. Ann Med Interne. 151 Suppl B: B44–8. PMID 11104945. ^ Dillehay; et al. (2010). “Early Holocene coca chewing in northern Peru”. Antiquity. 84 (326): 939–953. ^ Rivera MA; Aufderheide AC; Cartmell LW; Torres CM; Langsjoen O (December 2005). “Antiquity of coca-leaf chewing in the south central Andes: a 3,000 year archaeological record of coca-leaf chewing from northern Chile”. Journal of Psychoactive Drugs. 37 (4): 455–458. doi:10.1080/02791072.2005.10399820. ^ a b Robert C. Peterson, Ph.D. (May 1977). “NIDA research monograph #13: Cocaine 1977, Chapter I” (PDF). Retrieved 2007-05-26. ^ a b Eleanor Carroll, M.A. “Coca: the plant and its use” (PDF). Retrieved 2007-05-26. ^ a b Musto, DF (1998). “International traffic in coca through the early 20th century”. Drug and Alcohol Dependence. 49 (2): 145–156. doi:10.1016/s0376-8716(97)00157-9. ^ a b c d e f g h i j k l m n o “Coca leaf: Myths and Reality”. tni.org. 5 August 2014. ^ James, A., Aulick, D., Plowman, T., 1975 “Nutritional Value of Coca”, Botanical Museum Leaflets, Harvard University 24 (6): 113–119. ^ a b c d e Museo del Oro, Banco de la Republica. “Museo del Oro, Colombia” (in Spanish). Banrep.gov.co. Archived from the original on 2013-05-11. Retrieved 2012-11-09. ^ a b Transnational Institute – Coca Myths, 2009. ^ “Drugs and Democracy | Coca leaf: Myths and Reality”. Tni.org. 2011-02-18. Retrieved 2012-11-09. ^ ZAPATA-ORTIZ, Vicente. “UNODC – Bulletin on Narcotics – 1952 Issue 2 – 008”. www.unodc.org. Retrieved 2018-06-20. ^ “Chavez admits to chewing coca leaves”. UPI. Retrieved 2018-10-06. ^ Bolivia and Peru Defend Coca Use March 6, 2008. “The United Nations lacks respect for the indigenous people of Peru and Bolivia who have used the coca leaf since forever,” said Peruvian Congresswoman Maria Sumire. “For indigenous people, coca is a sacred leaf that is part of their cultural identity,” she said. ^ “Evo Morales launches ‘Coca Colla‘“. Telegraph. 10 January 2010. Retrieved 22 January 2010. ^ “Bolivia banks on ‘Coca Colla,’ fizzy coca-leaf drink”. AFP. 10 January 2010. Retrieved 22 January 2010. ^ Peru. History of coca, “the divine plant” of the Incas; with an introductory account of the Incas, and of the Andean Indians of to-day. W. Golden Mortimer, M.D. Ed. J. H. Vail & Co, 1901. Abraham Cowley‘s poem “A Legend of Coca” : in chapter I An introduction to the history of coca, pp. 25–27. ^ “Objections and support for Bolivia’s coca amendment”. Transnational Institute. ^ “Aprueban denuncia contra la Convención de Viena”. Los Tiempos. 2011-06-23. Retrieved 2011-06-23. ^ “COCA, DRUGS AND SOCIAL PROTEST IN BOLIVIA AND PERU”. International Crisis Group. 12: 39. 18 January 2005. ^ “Importers Notice of Registration – 2011”. deaDiversion.usdoj.gov. Retrieved 2012-11-09. ^ Branch, Legislative Services. “Consolidated federal laws of canada, Controlled Drugs and Substances Act”. laws-lois.justice.gc.ca. Chisholm, Hugh, ed. (1911). “Coca” . Encyclopædia Britannica. 6 (11th ed.). Cambridge University Press. pp. 614–615.